One of the things I love most about being a part of Chartreuse and Co., is that I've made a bunch of new friends! 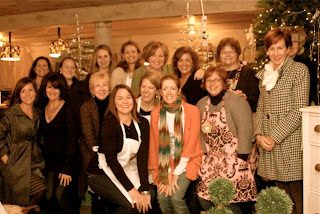 They're an incredibly talented, creative group of women that turn an old dairy barn into an amazing shopping experience the third weekend of every month. We kicked off the holiday season last Thursday night and it truly was a magical evening. I'm so proud to be a part of the group! That's me in the chartreuse sweater in the back row. Yes, the one with her eyes closed! And that's Molly to my right. The super talented artist I call my partner in crime at Chartreuse! For the holidays we'll be open every Friday, Saturday and Sunday until mid December. OHHHH I wish I was one of the gals! :) what a great group you are so lucky to be apart of! Super duper with a cherry on top happy for YOU!! and I'm coming shopping.... without my chickadees so i can load up! hee hee okay in my dreams load up my car but hey this girl is all about big DREAMS!! Did you get rained out on Wed,? we nixed Crumpton for Baltimore and Lunch in Annapolis instead. happy friday are you having your wine yet! so good to see you the other day! the place looks fabulous! you are all an inspiration and have so much to be proud of. I stopped by Chartreuse on Friday but you had already left. Everything looked great. See you next time.